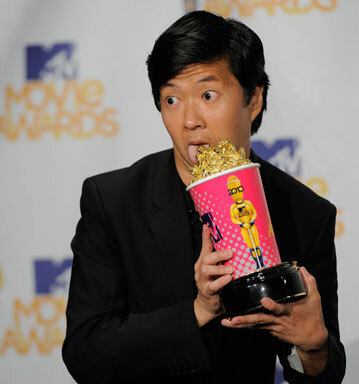 Ryan Gosling received no major award noms (no Oscars, no Golden Globes) last year, but he’s in luck: MTV has announced that the Almighty Goz is up for three golden cups of popcorn at the MTV Movie Awards. He’s up for Best Male Performance and Best Gut-Wrenching Performance for Drive and Best Kiss for Crazy, Stupid, Love. Even if he does win Best Kiss with actress Emma Stone, his acceptance will likely seem inferior to his 2004 win for The Notebook with Rachel McAdams (Goz and McAdams even managed to shock wild girl Lindsay Lohan).